UCF won its 22nd straight game on Saturday, beating Navy at home by a score of 35-24. The Knights (9-0, 6-0 AAC) are still No. 11 in both the Coaches Poll and the AP Poll, but they moved up one spot to No. 11 in the College Football Playoff rankings this week. ESPN’s College GameDay will be in town for this Saturday’s primetime matchup against Cincinnati, but before we get there, let’s check in on what else went down around the AAC in week 11. The division races in the AAC are still interesting with two weeks left in the regular season. In the AAC East, Saturday’s game between No. 11 UCF and No. 24 Cincinnati will be huge in determining the winner of the AAC East. 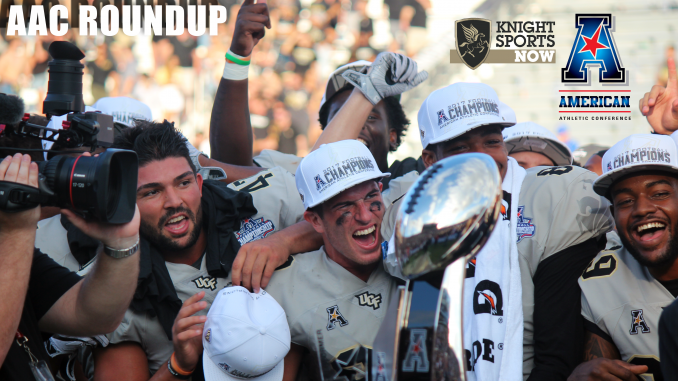 If the Knights win, they clinch the division and a spot in the AAC Championship Game. That would give the Bearcats two conference losses and even if Temple won its remaining games, UCF owns the tiebreaker over the Owls. However, if Cincinnati pulls off the upset and snaps UCF’s winning streak, there would then be a three-way tie for first in the division heading into the final weekend (assuming Temple takes care of South Florida). Should UCF, Cincinnati and Temple finish the season tied, tiebreakers would be in Cincinnati’s favor. For the Knights, it’s simple. A win on Saturday gets them a shot at a second straight conference title. The Mustangs control their own destiny with two weeks left, but there’s a lot of potential chaos on the horizon if they falter. Both division races in the AAC are still competitive with two weeks left, which is fun for college football and stressful for the teams and their fans. There are three teams still alive in the AAC East and four in the AAC West. If the two current division leaders win out, the AAC Championship Game will feature UCF against SMU. The Knights beat the Mustangs 48-20 back on Oct. 6.